The Townshend, VT area contains many firms that will help you with your building needs from constructing a brand new home or business related building from scratch to doing updates or improvements to an existing building. Most are smaller firms, either sole proprietors or firms with just a handful of employees. Any of them will be more than happy to discuss your project with you and give you a quote. 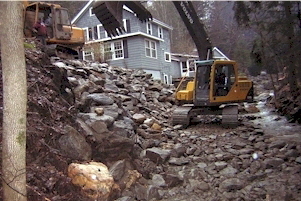 The photo is courtesy of a Townshend resident and pictures a local excavation contractor reinforcing the banks of a brook on their property after Hurricane Irene greatly eroded them in 2011. A great deal of damage was done to both public and private land and buildings during Irene. Repair work kept area contractors and engineers very busy afterward.